Take US-23 Exit 37 B to Washtenaw Avenue west (Business Route US-23). Continue west and north on Washtenaw Avenue, which becomes Huron Street, (Business Route US-23) to Fifth Avenue. Turn left at Fifth Avenue and go south two and a half blocks, staying in the left lane. Kempf House is on Division Street, on the left. 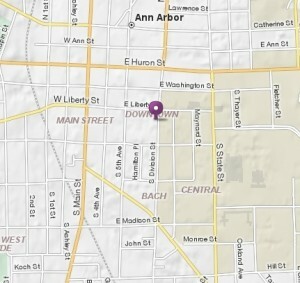 Take US-23/M-14 Exit 3 (downtown Ann Arbor) to Main Street south (Business Route US-23). Continue south on Main Street to William Street, turn east (left) on William Street and go three blocks to Division Street. Turn north (left) on Division Street (one-way street), stay in the left lane. Kempf House is on Division Street two doors north of the parking lot entrance, with a white picket fence. Take I-94 Exit to US-23 north. From there follow directions from the south above. Take I-94 Exit 171 to Jackson Road east which becomes Huron Street (Business Route I-94). Continue east on Huron Street to South Fifth Avenue. Turn right on South Fifth Avenue and go south two and a half blocks, staying in the left lane. Turn onto Divison Street, Kempf House is on Division Street, on the left. Parking is available in the structures on S. Fifth or E. Washington.